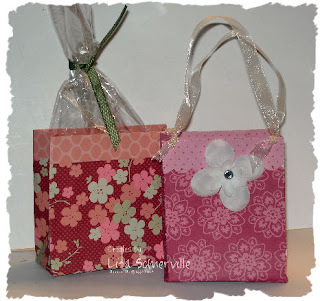 The idea for making these cute little bags was shared at Leadership this past weekend in Palm Springs. I've altered the idea to suit my needs by adding the scallop to the one bag as my trim, on the other bag, I didn't add any handles as I thought it would be great to be able to slip in a filled cello bag. These are great! My first thought was that they were inspired by the wonderful bags everyone is pining over. Gorgeous bags and welcome home! cute, Lisa! are you going to post a tutorial so we can learn how to do them too?? I bet you had fun! Great take on these bags! The scallop edge looks awesome! and what are you going to put in mine? Too cute! Love these Lisa! The scallop is a nice addition, can't wait for a tutorial! It's SO good to see you back. You keep us inspired. These bags from Leadership are gorgeous and adorable. You keep me so inspired!! I love everything you do. I can't wait to read more about Leadership. Isn't Palm Springs the best? You went in the best season. It is horrible to be there in the summer, HOT doesn't even describe it. 120 oven like with no breeze, ouch!